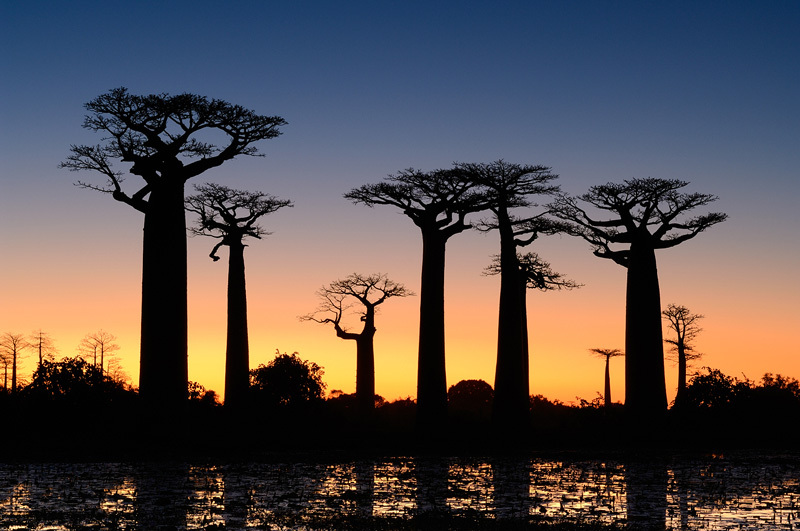 Adansonia grandidieri, sometimes known as Grandidier's baobab, is the biggest and most famous of Madagascar's six species of baobabs. This imposing and unusual tree is endemic to the island of Madagascar, where it is an endangered species threatened by the encroachment of agricultural land. They have massive cylindrical trunks, up to three meters across, covered with smooth, reddish-grey bark. They can reach 25 to 30 m (80-100 ft) in height. I shot this image after sunset in Madagascar. I used the swamp in the foreground to get the reflections. Finalist in the BBC Wildlife Photographer Of The Year.